I like the turning mechanic (that you need an action to change the direction you are facing). Very simple, but also very fun - at least for a while. My only complaint would be, that it seems to be a bit random - but then again that is the nature of such games. Thanks for the indepth reply, I will make sure to play again. - And this time with the full knowledge about upgrades and keyboard commands! I liked it. But.. is there an end? I play medium, I have the screen full with towwers and over 2k of each resource. No more place to build and no upgrade options. libGDX Jam - Powered by RoboVM & Robotality community · Posted in DevLog about "Life in space - and how to get rid of it"
It consists of 4572 screenshots - one was taken each minute. So that means it took me about 76 hours to make this game. Hey, your game saved me. My game wouldn't take any keyboard input on itch.io .. but I remembered that I played yours, and that it worked. So I went and had a look at your index.html - and found the stuff needed to get it going. Because that's what google came up with (but they didn't have a solution). ... when my wife suggested we do the audio recordings for the "mission command" radio texts. I had already scrapped the code (but that was back pretty quick, thanks to git) and we did it. She recorded the messages, I removed the noise (cheap mic headset) and edited the sound a little. Then I cut it all up and converted to oggs.. and now there is voice acting in the game! PS: I had a hickup (took me 5 uplaods to itch.io to figure it out) that the game wouldn't take any keyboard input when embedded on itch. The solution (I got it from the index.html of sanoke's jam entry) was to put window.focus(); in the index.html within the handleMouseDown function. I optimized my menu buttons. Before I was using modified default skin buttons - but they only have a 1 pixel border. When downscaling the menu, the border was sometimes lost. It didn't look good. I have now made my own 9patch buttons, that are packed via texture packer and loaded via the skin. All my levels are done. Tomorrow I will write the last mission control texts and then it's done. 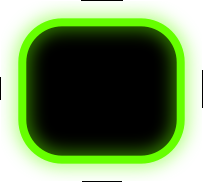 I plan to publish to itch.io tomorrow night and then have a nice and chill weekend. Let's see if anybody can make it there and back again. I had a friend playtest the first level. Based on his observations I changed some stuff, mainly no longer can you can uneven amounts of action points. - Because that would mean you have to walk 1 tile each round, or end the round by clicking on yourself. (because shots cost 2 points.) - So now every upgrade to AP is 2 points at once. Also some smaller stuff was found, like dead enemies were hiding upgrades under their bodies (now the upgrades are rendered over dead enemies). And to better show the goal of each level, I added a teleporter device that you have to get to. Other than that I finished level 2 monsters, started level 3 .. I still plan to release 6 levels. 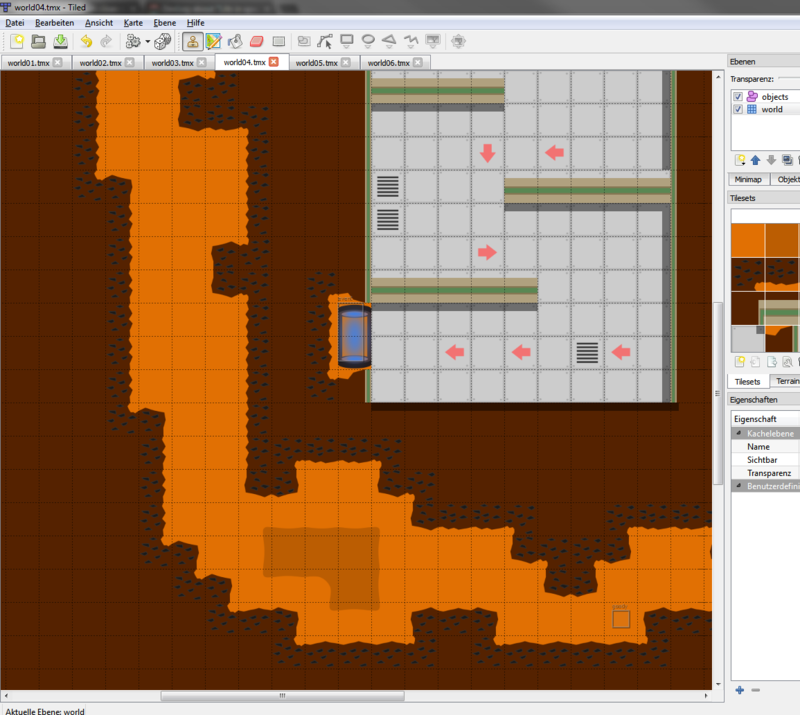 Here is another level editor screenshot - with the teleporter level end point. Just had a two hour bug/problem hunt. The gwt version (html5) wouldn't run anymore. This had to go into the SpaceMain.gwt.xml. The first one for my json class (this class is filled via reflection when loading the json file). The second one.. no clue why, but ArrayLists can't be deserialized otherwise. Wow, man I am happy it's up and running again. After taking a break yesterday today I started building some levels. The first level is pretty much done - you go around, shoot aliens, get two Action-Point Upgrades (you start with two action points and end the level with four). For level two to five I did the layout in tiled, but haven't placed enemies yet. I'll try to get feedback on level one.. too hard? too easy? And then design the finish the rest of the levels. I am still thinking about putting in some voice acting - but I am not sure that will make the final cut. 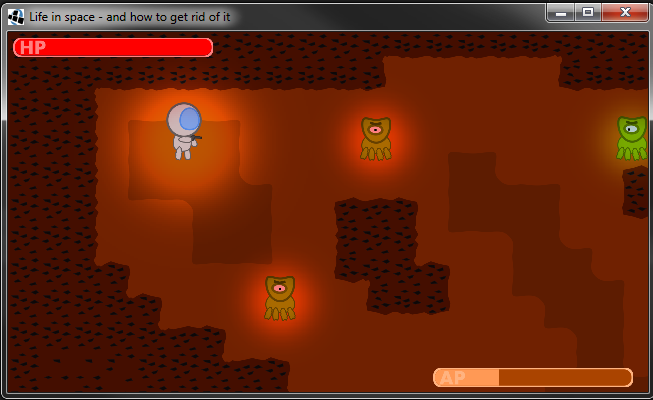 Other then that I only plan on finishing up the levels and do some play testing. - No more new features from now on. I have finished implementing shooting enemies (both stationary and moving). Implementing it wasn't too hard, since all the mechanics were already in place (line of sight, shoots flying and hitting) but it still took some doing. Good start into the sunday. Last night in bed before falling asleep I came to the conclusion, that levels without doors & keys are too boring. So today I made them, the doors & keys I mean (and sounds. and event trigger and user interface display of key cards). Today I finished the menu and some important game events. The game safes when you complete a level, so you can come back later and not lose all your progress. 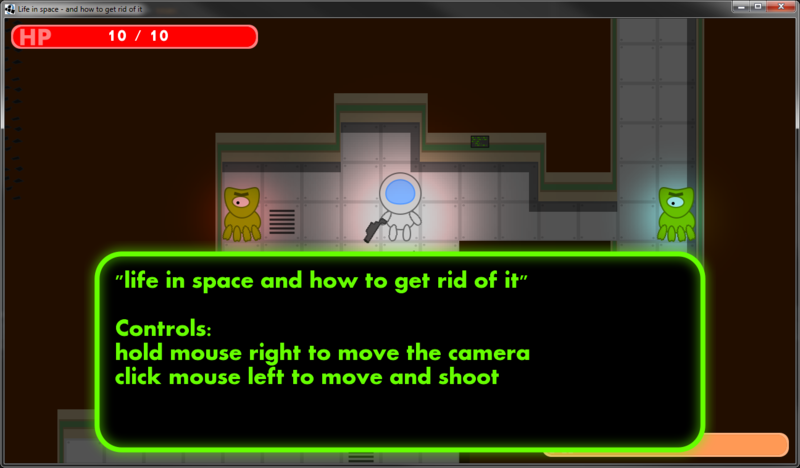 all three can be placed and configured in tiled (as big objects, the area they cover is the trigger area). I also made the player and the enemies completly configureable via tiled. For enemies this means ap, hp, dmg and looks. The last thing I did today is an optional audio system for the text boxes. I am not sure there will be audio.. but if it comes to it, the system to play it is in place. Breathing some life (pun intended...) into the menu. ... and the stage fades out. What took the most time was to find a tutorial on how to do a planet and stars - and then actually doing them. The planet is actually inkscaped (I didn't even know about the filter menu for noise..) and the stars are hsv noise from gimp with some manual edits. But to be clear: This is hacked together learning as I go, so there is no real structure. But hey, only 9 days left, what can you do. Gotta get things done! 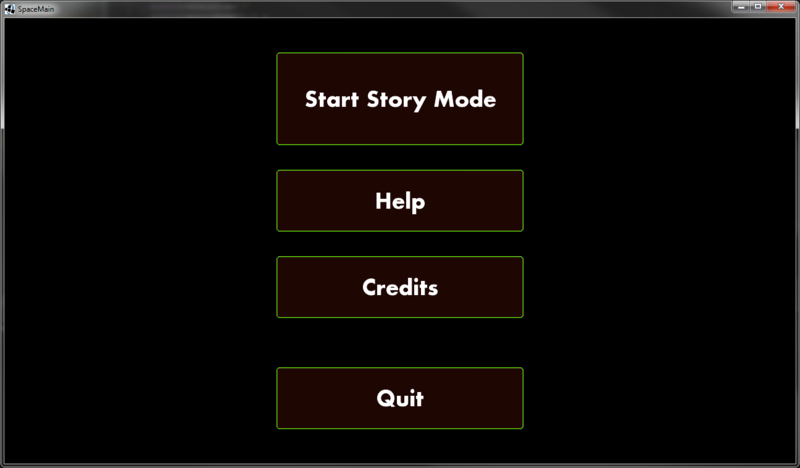 Today I added a main menu (my first time using libgdx ui elements like stage, table & buttons). It worked out okay - but it's boring. I will need some background.. at least the music is playing. I also added json loading of texts (this was super easy, libgdx json support is awesome) - 2 lines to load from json into a custom class. This is used for credits & help screens right now - but I plan to use it for dialog/story in the game too. I also experimented a bit more with android - i tweeked the scrolling for different resolutions, added support for the back-button (also for ESC on desktop). Overall this took all evening. 3) I am leaving this out.. if you can see it (including scrolling) you can try to shoot it - I don't think I can manage a good range indicator and stuff like this until the deadline. 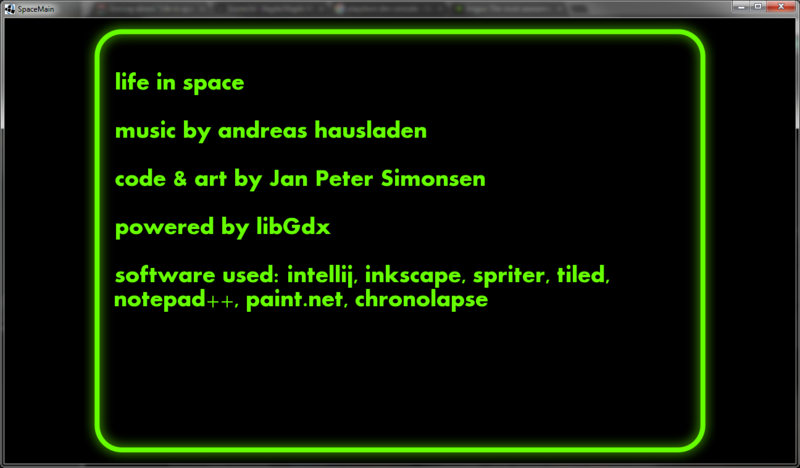 Unplanned progress: Andreas reworked the background music, it's now even cooler than before. Today (and last night) I had problems with the tilemap. I hope they are now resolved. - One of the issue was, that all tiles where of by 2px due to fiddeling around with the packer options and not adjusting the tiled ".tmx" file. This wasn't visible immediately because I had bleed enabled, so those 2 pixel had the correct colors - but when changing the resolution sometimes there were weird tilemap artifacts. Now the tmx file and the texture packer settings should be matching. My problem was, I had margin in tiled set to 4. Since all the the tiles are padded you don't really notice that all centers are off by 2 pixel (at least with my 64x64 tiles). It only led to rendering errors when zooming out. I hope that's gone now. So (of course) I didn't actually develop the stuff on the list from the last post. Well, I did do the health pickups (and they paved the road for further pickups). Muzzle flashes, they were needed because if the enemy is right next to you you never see the projectile fly. This way there is visual feedback for the attack in all cases. The muzzle flash is part of the shooting animation (in spriter). The interesting part was to make it fit with the big gun and the small gun. The gun change is done via character maps (where you can replace one of the animation's sprites with another picture). Since the size of the guns isn't the same the muzzle flash wasn't appearing at the correct position. Another thing I experimented with is ninePatch in libgdx. The background of the box including the round edges is a ninePatch image. This way there is no blurring even when resizing it. Notice how the edges are the same and only the repeatable part gets stretched out. libGDX Jam - Powered by RoboVM & Robotality community · Replied to eis in DevLog about "Life in space - and how to get rid of it"
Depending on level the enemies now not only have different hp & looks, but also varying amounts of action points. If you target an enemy, you can now see the health percentage. I am not sure if I will show actual values later. On my list for today are also: an indicator how much of your action points a move / shot will cost and health & weapon pickups. when closing the editor the symbol (red x) indicates that you would lose all changes (but it is indeed the "safe" / "done" button) that is a little counter intuitive. That's always a problem for me too - I mean finishing a game. But that's why I join game jams .. they do motivate me (and should motivate you too) to really finish a game within the timeframe. 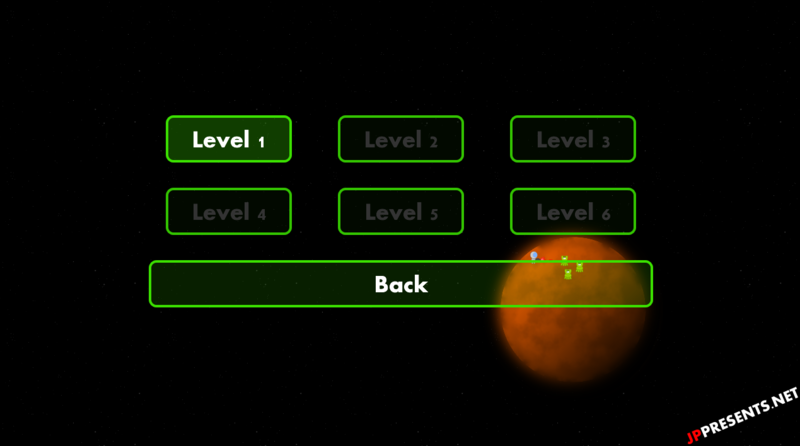 If you try it, keep in mind: This is not a well designed level, it's just five aliens from lvl 1 to lvl 5 .. so you will die (because you are only lvl 1), if you die, only reloading the browser page (f5) will restart the game. You control everything with the mouse. libGDX Jam - Powered by RoboVM & Robotality community · Replied to XdebugX in DevLog about "Life in space - and how to get rid of it"
I have checked the java documentation, and it just says it's to avoid conflicts with class names. So as long as you don't have classes named the same as your packages you are fine! I am going the same route as you - first getting my game working in a premade level and after that (maybe) random generated levels. Just had a little (2 hours wasted) hickup. I noticed that I managed to use capitalization in my package name "net.jppresents.lifeInSpace" .. package names should of course be all lowercase. So quick fix, IntelliJ refactor "lifeInSpace" -> "lifeinspace" .. and that's when things went wrong. Windows does not care about case in filenames / directory names. It does save it, when you create a file/dir.. but when changing it, things go weird. The refactor changes the case in all files that reference the package, but can't (due to windows) actually change the directory names. This (with some unexplained gradle behavior) killed the main class from my desktop build.gradle and made commiting the name change to git impossible. easy fix: Refactor to a different package name, I choose "net.jppresents.space" and fix the build.gradle. But getting to that fix took some swearing and complaining. Today was all about combat, action points and a bit of user interface. The only thing missing for complete combat is that the monsters attack (they already follow the player around, but they don't bite yet). When that is done I'll make another video. I am curious, why would you develop on your smartphone? Do you have a keyboard hooked up to it? I can't even imagine to code on a virtual keyboard on a 5" display.. Mainly pathfinding and the beginnings of a ui (indicator what your action will be, walking, not walking, targeting). 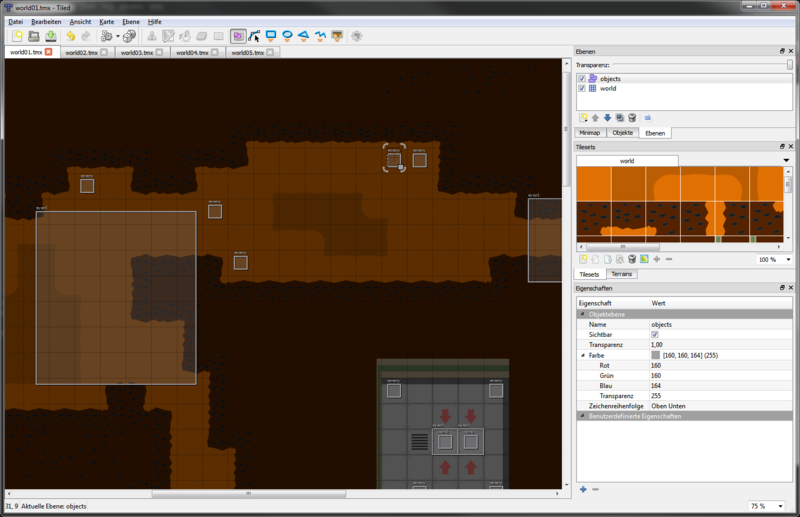 Also player and monster positions are now read from the tiled map file. Okay, after the family visit over Christmas I got back to the game. I continued working on the tech, there is now a light system (thanks to ‏@orangepascal and his tutorial http://techblog.orangepixel.net/2015/07/shine-a-light-on-it/). I made tiles (which I don't like, but they have to work for now) and managed to load the tiled map into the game. After animation, light and map were up and running (as a big chaos in the main class) I have begun moving stuff into classes. (Right now the light class is done). Did the library setup for my game today..
.. I packaged the spriter runtime ( https://github.com/Trixt0r/spriter ) into a jar, to include it. And I set up texture packer to get nice atlas files for my animations. Both things took really long.. but they are done. So maybe I can actually start to code tomorrow! So I have made some anmiations in spriter..